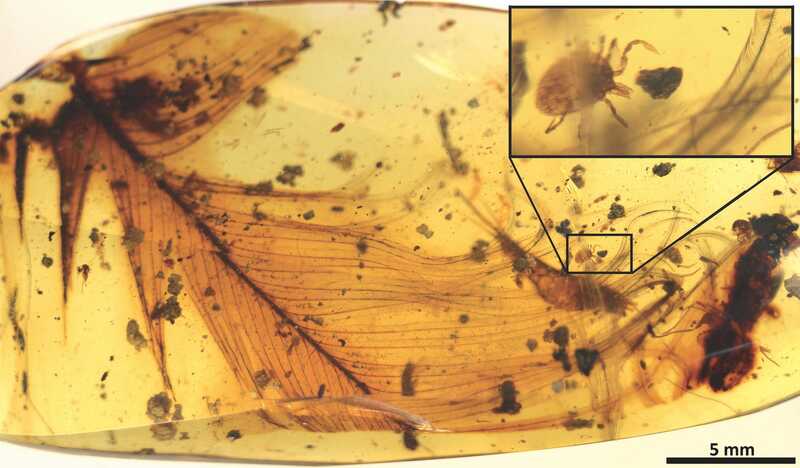 Peñalver et al., 2017Hard tick grasping a dinosaur feather preserved in 99 million-year-old Burmese amber. A new study of a fossil from Burma reveals a tick grasping a dinosaur feather, providing our first evidence that ticks preyed on dinosaurs. Scientists also found a new species of tick –Deinocroton draculi, or “Dracula’s terrible tick” – that fed on dinosaur blood. Unfortunately, the “Jurassic Park”-style extraction of dinosaur DNA from the ticks is still impossible. 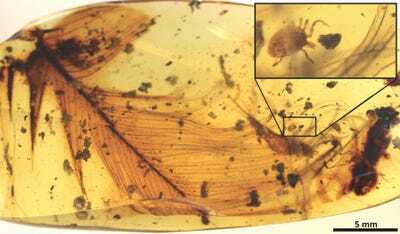 Mosquitoes weren’t the only creatures to feed off the blood of dinosaurs and then to get trapped in amber. Blood-sucking ticks also feasted off dinosaurs 99 million years ago, according to a new study published in the journal Nature Communications that examines a Burmese amber fossil containing a trapped tick grasping a dinosaur feather. It’s the first direct evidence we have of the parasites feeding on dinosaurs, according to the study. It’s also the oldest evidence of ticks acting as parasites, feeding on other creatures. “Ticks are infamous blood-sucking, parasitic organisms, having a tremendous impact on the health of humans, livestock, pets, and even wildlife, but until now clear evidence of their role in deep time has been lacking,” Enrique Peñalver, lead author of the study, said in a press release. Inside other chunks of Burmese amber, the researchers found the remains of new tick species that they believe fed off of dinosaurs, as two appeared they had been feeding from a nest of feathered dinosaurs. The new tick species is named Deinocroton draculi, or “Dracula’s terrible tick” – one particularly bloated specimen was so swollen with blood that it was eight times the size of its non-engorged companions. E. PeñalverStudied tick pieces and extant hard tick for comparison (tick is 5 mm long). 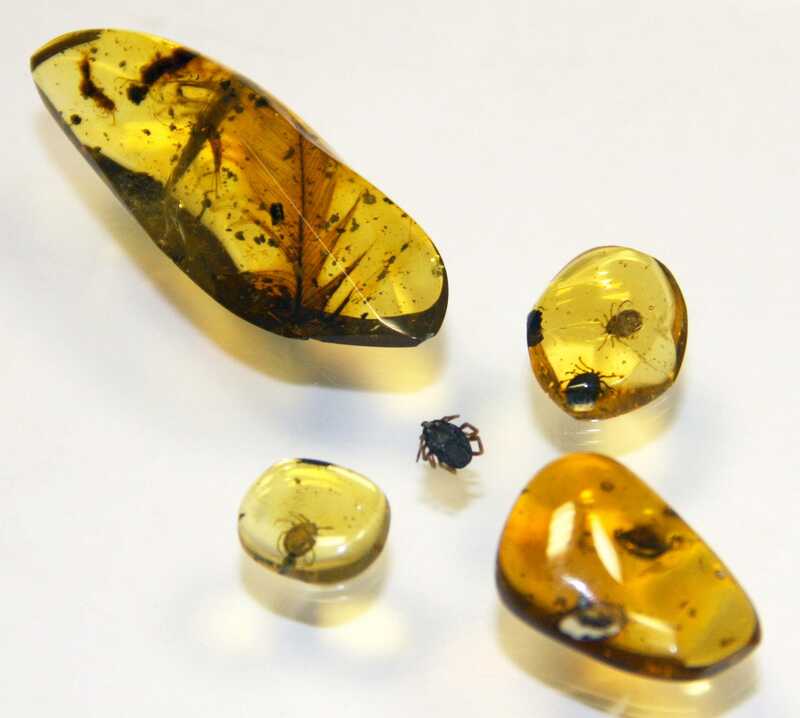 Unfortunately (or fortunately, depending on your perspective), the Jurassic Park scenario where DNA is extracted from an ancient blood-sucker trapped in amber is no more possible with these ticks than it would be with mosquitoes. DNA molecules themselves degrade far too quickly for remains to still contain a legible genetic code (some researchers think our best chance of re-creating dinosaurs is to reverse engineer them using genetic editing tools). The blood inside the tick that died shortly after feasting on what was presumably a mid-Cretaceous – something like a velociraptor – had been damaged enough by other minerals that it was impossible to identify whatever had made up its last meal. But we now know that extinct species of the same sorts of parasites that cause us all kinds of problems today were up to the same thing back then. And whatever caused the final extinction of the dinosaurs, we know that ticks managed to thrive through the event.